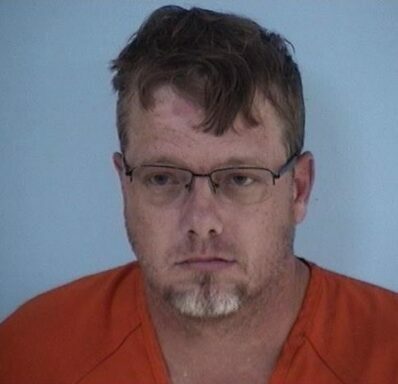 DEFUNIAK SPRINGS, Fla— A Walton County man is arrested and charged with two felonies after shooting and killing a dog Tuesday evening. A Walton County Sheriff’s deputy driving on Girl Scout Road noticed two dogs running on West Juniper Road on the passenger side of a 2002 Chevrolet Trailblazer when he heard a gunshot. The deputy looked down Juniper Avenue and saw a brown dog lying in the street. The deputy turned around and conducted a traffic stop on the driver who identified himself as Robert Lee Bryan, 44. The deputy immediately asked Bryan where the weapon was located. A .40 caliber Taurus handgun was found lying on the passenger seat unloaded. Bryan claimed the dog in question had jumped on his Yorkie the night before. However, there was no report or call made to Animal Control regarding the incident. Bryan was charged with aggravated animal cruelty and discharging a firearm in public within 1,000 feet of a person. He was transported and booked into the Walton County Jail and received a $2,500 bond.